Today we got out our bricks to play this listening game for toddlers. Ours are the Melissa & Doug cardboard bricks. You can find them or something similar on Amazon. They are a lot of fun for imaginative play. 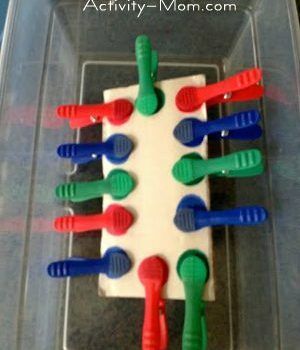 If you don’t have bricks you can use construction paper or even colored painter’s tape on the floor for this activity. 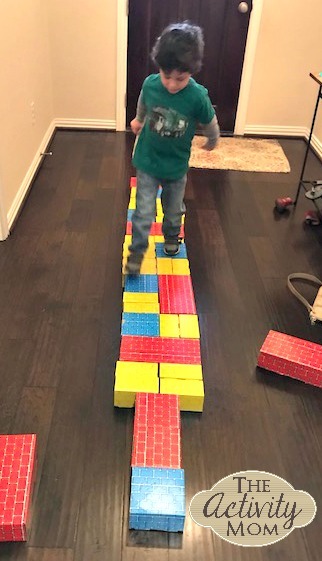 I set the bricks up in different patterns and challenged my son to walk on it without touching any of the yellow bricks. We did several variations and I made them harder each time. We called it “Walk the Plank” and pretended the floor had sharks swimming around. If he touched a yellow brick he would fall in and have to start over. “Again! Again!” He kept asking. It kept us entertained for the better part of an hour. I love this listening game with toddlers because it helps to develop balance, coordination, patterns, color recognition, and imaginative play. 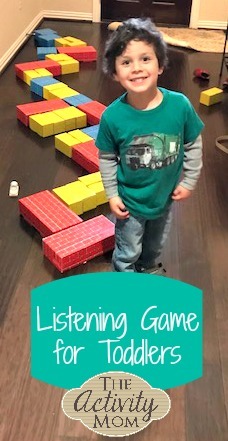 This Listening Game for Toddlers was awesome! Plus, anything that keeps us happy indoors on a very cold winter day is a win in mom’s book!